Reithofer, right, has given Krueger, left, a hard act to follow. MUNICH (Bloomberg) -- The first test facing BMW Group’s new CEO will be to emerge from the shadows of the predecessor who will be watching over his shoulder as chairman. 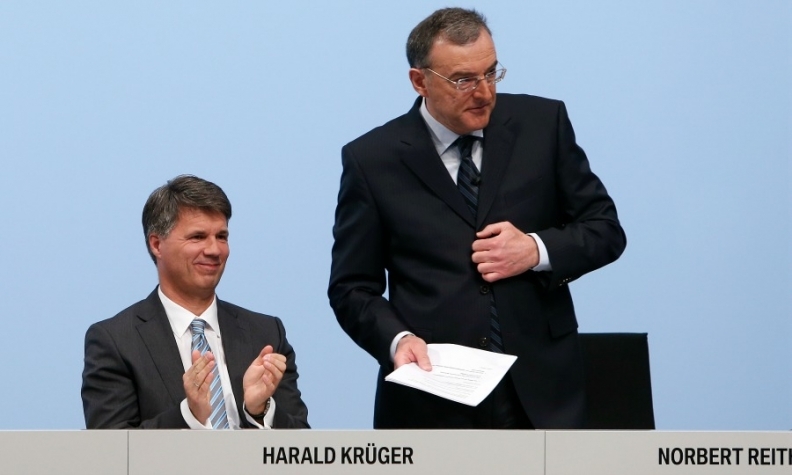 Norbert Reithofer's shift to chairman from CEO today without the recommended two-year break could make it harder for incoming CEO Harald Krueger -- at 49, the youngest chief of any major car manufacturer -- to break with his predecessor's strategy. While BMW sits atop the luxury-car market, the industry is changing, and the automaker faces new competitors such as Tesla Motors. "Due to his relatively young age, he hasn't been able to really make his mark so far," said Stefan Bratzel, director of the Center of Automotive Management at the University of Applied Sciences in Bergisch Gladbach, Germany. "It'll be his challenge to leave his stamp on BMW at a time that's bringing far-reaching changes to the auto industry." For Krueger, the risk is that there may be nowhere to go but down. Reithofer, 58, is handing over a company that's outsold Mercedes-Benz and Audi since 2005, but BMW's lead has been shrinking. Reithofer told shareholders today in Munich that the economy in China, BMW's biggest market, is "losing momentum." China's slowing economy and a slump in profits from BMW's Chinese joint venture during the first quarter will probably keep a lid on the company's share price in the coming months, Kristina Church, a London-based analyst for Barclays, said in a report Wednesday. That puts the new CEO in a position of determining how to proceed with expensive projects initiated by his predecessor. That includes the "i" subbrand, which consists of the i8 plug-in hybrid supercar and the electric i3 compact. BMW said in January that cheap gasoline makes electric models even tougher to sell. Krueger also need to decide how to proceed with using lightweight but pricey carbon fiber, a material BMW pioneered for mass production. Typically for BMW, Krueger is a home-grown talent. He joined the company in 1992, almost straight out of Aachen University, Germany's top-ranked graduate engineering school. He has experience with risky projects that have paid off, helping to set up BMW's U.S. factory in Spartanburg, South Carolina, in the 1990s. While it's now set to be BMW's biggest plant, manufacturing outside Germany was considered risky at the time for a company synonymous with quality and precision. Reithofer boosted sales 55 percent to 2.1 million vehicles from when he took over in 2006 through last year. BMW became more profitable in that period, too, with its pretax margin on auto sales improving to 9.2 percent from 6.3 percent. The company has ceded some ground to Audi and Mercedes, however. Both competitors grew more quickly last year. "It's going to be tough to emerge from the shadow of such a successful predecessor, especially since Reithofer will remain as head of the supervisory board," said Juergen Pieper, a Frankfurt-based analyst with Bankhaus Metzler. Nikolai Glies, a spokesman for BMW, declined to comment on the implications of Reithofer becoming chairman of the company without a cooling-off period. Reithofer's shift to the chairman role without the break recommended by the German Corporate Governance Code is possible with support from shareholders who own more than 25 percent of voting rights. In the case of BMW, the Quandt family, which controls the company with a combined holding of 46.7 percent, has backed Reithofer moving immediately to the chairman's role. That's only happened at BMW once before, when Eberhard von Kuenheim moved from CEO to chairman in 1993. Other shareholders have said they'll vote against Reithofer seamlessly taking up the position, even if their opposition will mostly be symbolic. "A chairman needs a degree of critical distance," Ingo Speich, senior portfolio manager at Union Investment, said in an e-mail. "It's impossible for Reithofer to be impartial and objective when judging his own legacy."